i'm from germany and I have a Comanche, too. It is a 91, 4L 2WD, Pioneer modell. If I buy it, it stands about 6 years because of a transmission brake. So I put it on a trailer, bring it home and start with work. First I found a new transmission, a AX15 with a NP231J transfercase, than two axles from a 95 2.5TD Cherokee with a 3,73:1 gearing. So at one weekend we but everything in. Welded the axles that it goes to the Manche. Make the complete brakes new and start welding the side because it was rusty. If someone can say me how it work's with the ipad, I will do. I went through this couple days ago,I had to open a photobucket.com sign up then upload pics too there,then I linked the pics from there to here. You can use whatever online image hosting service you like, including facebook if you've got the right privacy settings. There's a thread pinned in the "testing" sub-forum. So, here are some pics. If I have the time I will post more. And here is my other Jeep. No Comanche, but the a CJ7 from 85, and a copy of a M100 Trailer from the belgian army. Nice Jeeps! Like the silver bedliner, its different. There are some more pictures. The mounted Transmission and transfercase (AX15 and NP231J), the new rebuilt axcles and a picture from the welded driver´s side. Some weeks are gone and i had no time to do much things. Next week i will finish the brakes and than make a testdrive. Last week i change the damaged trackbar, reinstall the rebulit tail lights and installed the XJ middle console. So the inside is finished and the tail lights looking like new. I will post some pics the next days. After a few weeks without work on the Comanche I finished today the brake Problems and install a new adjustable Rubicon Express Trackbar. The next days I will fix the electrical Problems with the tail lights. And than I will post some new pictures with the final to get it back to the street. Now I have finished the brake Problems and have drive the first miles. One new problem I have with the stearing. There are loud noises if I turn the stearing wheel. 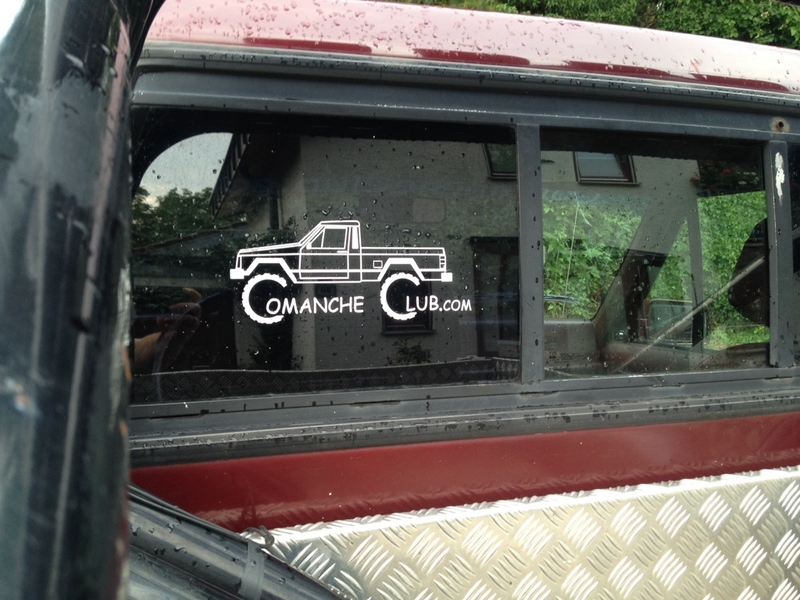 Today put on the Sticker from the "Comanche Club"!!! Herr TGJC, Ihre Comanche ist sehr schön. Es ist shade dass Stuttgart ganz weit weg ist! Gehe sie diesen sommer zu ein Jeep ereignis? Möglicherweiss gehe ich zu das ASP-Jeep weekend, in Möglingen. Hoffentlich ist mein deutsch begreiflich. ich weiß noch nicht ob ich es schaffe den Comanche fertig zu bekommen. Es sind doch noch einige Themen zu machen. Möglingen ist bei mir um die Ecke, eventuell fahre ich mit dem CJ hin. Ist aber noch nicht ganz sicher. Here are some new pics. I finished welding the side panels. Ich bin sehr beeindruckt von der Arbeit, die Sie getan haben, gute Arbeit! Ich bin mit einem Übersetzer, dies zu schreiben, so dass ich hoffe, dass es Sinn macht. There is no problem to write in english. I will post some more pics in a few days. Today I finished the last electrical problems with the back lights. The next step is to grind the rocker panels and mount the front cardan shaft. Then I hope to get the papers to bring it back to street legal.